If institutions developed in and optimized for the previous generation of infrastructure are no longer working, then where innovation is most urgently needed is not in product development but in the design of institutions themselves. Let me just say, I don’t challenge the idea that product innovation cycles are shorter due to globalization, nor that product innovation cycles are important to companies today. The whole focus of customer experience management emphasizes learning from customers while they learn from you, whether through ethnographic research , traditional surveys, or social media analytics, but always with the intent to better fit product/service experiences with the customer’s needs. We continue to see organizational ambivalence over how social relationships contribute to business outcomes. For instance, a recent IBM study reported that only 22% of CIOs surveyed think managers are prepared to incorporate social media into their work. Managers generally fail to acknowledge that social networks contribute to business outcomes and that enabling human connections between stakeholders (employees, business partners, customers) adds value to the company when employees share a substantive understanding of the business purposes served by the enterprise’s organization. How to facilitate that substantive understanding is the biggest question facing anyone considering collaboration and innovation in today’s companies. 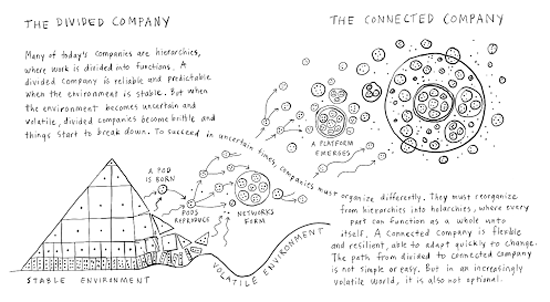 As my recent post, Revisiting the Great Innovation Debate contended, it is essential for people working in distant places, whether down the block, across the state, or on the other side of the world, to have a sense of a shared office to develop adaptive capabilities. Indeed, recent research on distributed work by Hinds and Cramton contends that knowing who one is collaborating with is a crucial part of the know how, the practical, institutional knowledge, that enables the adaptive capability organizations widely recognize they need to innovate, as well as deal with exceptions to process through informal and social learning. The point isn’t totally new, nor is it passe’. As many social software vendors acknowledge, it is important to integrate collaboration tools into the flow of work for them to succeed as useful tools. However, as a previous post noted, Social Software, Community, and Organization, that doesn’t mean the social communication afforded by particular tools is more effective if it supports only formal workplace, i.e. functional, goals. Social software must afford the capability for those using it to develop shared experiences of one another as people, not just corporate role players.